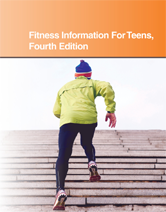 Fitness Information for Teens offers a comprehensive, fact-based guide for living a healthy and active lifestyle. The book includes information about the developing body, the components of fitness, and making and maintaining a fitness plan. It discusses exercise fundamentals and activities for team athletes and individuals--whether beginners or experienced competitors. Chapter 1— What Is Fitness?